Despite the widely understood advantages of public transport, the one stumbling block particularly for bus and coach travel has always been their dependency on fossil fuel. Although the emissions per passenger are far lower than for an equivalent number of single occupancy cars, the fact remains that they do churn out their share of carbon dioxide – and a number of other noxious gases besides. There is clearly something of a contradiction in terms to use even the very latest “clean” diesels in a form of transport which is universally promoted as eco-friendly. All-electric buses, such as the TrolleyCoach, with their zero street-level emissions, low noise and minimal environmental impact are certainly practical for short journeys and LPG – an altogether cleaner burning fuel than diesel – work well for longer trips. However, few things capture the whole green approach to life as fuelling transport with waste and while on the face of it, the idea sounds rather too good to be true, around the world it is fast becoming a reality. In October 2007, the UK’s first bio-bus initiative was launched – a cooperation between Stagecoach, bio-energy specialists Argent Energy and the East Ayrshire council – and provides a mould-breaking model for the future. Eight buses in the Scottish town of Kilmarnock will be run on pure bio-diesel, which will be made from various waste products from the food industry and used cooking oil, resulting in an annual estimated reduction of around 960 tonnes in carbon emissions. What makes this project particularly different, however, is the way it has deliberately set out to involve the local people. All the households along the routes have been given a container to collect their used cooking oil for recycling, which, once taken to the council’s recycling plant entitles the resident to “money-off” coupons for bus travel. In a time when green taxes have largely become the normal way to drive environmentally-friendly behaviour, it comes as a pleasant change to see a reward being offered by way of an incentive – a welcome carrot in a world full of economic sticks! As green waste – vegetable matter from our food and gardens – decomposes, it naturally forms biogas, which is rich in methane. Allowing suitable waste to break down under controlled conditions in specially designed bioreactors produces high quality biogas in a very efficient way and could provide another potentially useful fuel for buses. 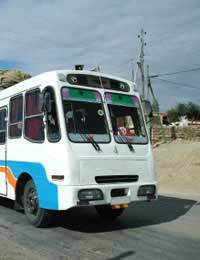 Buses on the island of Mauritius have already begun running on biogas and a number of companies in the UK have also used it in their vehicles. Although bio-diesel and biogas fuels are a major step forward for environmentally friendly travel, the fact remains that they still involve releasing carbon dioxide – although admittedly not the “ancient” carbon from conventional diesel. Finding a truly clean fuel is the Holy Grail for green travel – and the answer may just lie in hydrogen and fuel cells. A recent study by the Hydrogen Partnership concluded that London’s rubbish could be used to produce hydrogen – extracting the energy in the waste to form a renewable source of hydrogen. This gas could be used to drive buses without any of the carbon, nitrogen or particulate pollution of today’s fleets, since the only emissions from a fuel cell using pure hydrogen is water. Such buses have already come through successful trials as part of the EU’s Clean Urban Transport project and a number of European cities – Amsterdam, Barcelona, Berlin, Hamburg and London – have signed up to developing the buses and promoting the technology. Currently fuel cell engines are expensive to produce, but the race is certainly on to make them more commercially available. The amount of rubbish we generate and the size of our carbon footprints are two of the most pressing contemporary environmental issues, which is probably why the idea of making use of one to solve at least part of the other has such a strong appeal. The fit is a logical one since most waste arises where public transport can be most beneficial – in our towns and cities. Between bio-diesel, biomass and hydrogen-driven fuel cells, the future for clean, green bus fleets looks very likely to be fuelled by waste. Is Public Transport Always Best?